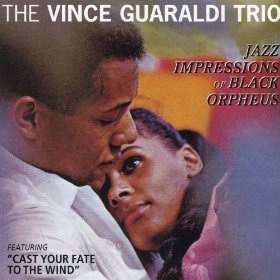 Vince Guaraldi was one of those composers and musicians who inhabited that area between jazz and jazz influenced easy listening music and he did this very successfully. He composed a number of commercially successful songs on of which is the title of this album. He also composed the soundtrack theme music for the Charlie Brown “Peanuts” cartoon television series. He also has some impressive jazz credentials having recorded with Conte Candoli and Frank Rossolino and also Stan Getz and Cal Tjader but the main body of recorded work is with his own group some of which are bordering on the easy listening genre but were commercially successful. The first eight tracks of this album are a straight re-release of the album of the same name plus five tracks of alternative takes of the same tunes. The further tracks are live and recorded at the San Francisco, Blackhawk club with the guitarist Eddie Duran and bassist Ron Crotty filling out the trio. Although Vince Guaraldi is a more than competent jazz pianist it cannot be said that he belongs in the front ranks of it’s exponents some of the tracks on this album border on the easy listening style but there are a number that bear closer attention. “Manha De Carnaval” has a good feel to it and is given a more reflective interpretation than we have come is to expect. Buddy Johnson’s composition “Since Fell For You” is given the block chord treatment which is quite effective on this particular instance. There is a nicely paced version of Jobim’s “Felicidade” with the rhythm section giving good support without being over pushy which is true throughout the album. There is not a great deal to be gained from the alternative takes except they do fill out the time. The three live tracks with Vince Guaraldi supported by guitar and bass give the album a nice touch of variety. There is some particularly fine guitar work on”The Night We Called it a Day” which has a touch of celeste from the pianist but apart from that it is Eddie Duran’s guitar all the wway. Not an essential purchase but there is enough of interest to keep piano buffs happy.